One of our new big pots, sponsored by Levi Strauss & Co., only using indigo grown in the field right next to us. 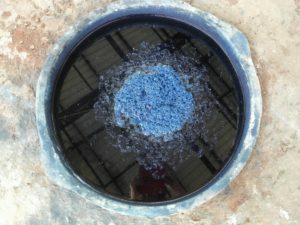 A homegrown fermentation indigo dye bath, anyone? 23 August 2018: Local Eco-friendly dyeing requires local Eco-friendly wood for fueling the water baths. This is what it looks like when the logs have been delivered. 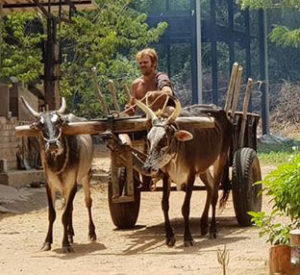 Coming from nearby community Nine Palms the traditional bullock cart does the job. 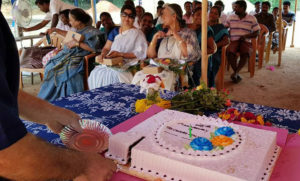 Gopal, born in Auroville, is at the reins. What perhaps most signals the entry into Auroville is the forest. Ever since the community was founded in 1968 the reforestation effort has been on-going. The trees add to the magic and keeps the place running, be it goats from the neighbouring villages or units such as The Colours of Nature. Herders rest in the shade and dyers do their work resting assured that the negative impact on the environment is minimized. Meanwhile, more trees keep being planted here in Utopia-in-the-making. For a video of the logs arriving: Bullock Cart Arrives. 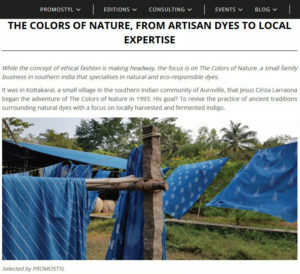 31 July 2018: As recently reported by The Times of India, top global fashion brands may get hit as the local dyeing industry is facing shortage of dyes due to China importing raw materials, used to make dyes, from India. 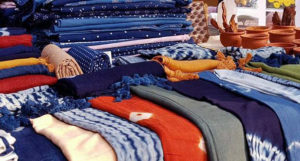 The news outlet reported, on June 16th, that dyeing factories considered scaling down operations just as orders were pouring in from international markets for the spring 2019 season. The reason? A price hike of dyes by nearly 30 per cent over 10-15 days was making it unsustainable to carry on operations. Natural dyes come at a premium, but without hazard to the environment. At The Colours of Nature, we declare now as good a time as ever to go natural, if you haven’t already. 11 May 2018: On May 6th, 2018, The Colours of Nature celebrated its 25th Birthday! We had a special lunch with birthday cake and dance performances for all of the staff. Three women distinguished guests of honour also joined in the festivities: Victoria Vijayakumar (Manager of Aranya Naturals), Ratna Krishnakumar (Founder of Aranya Naturals) and Jagada Rajappa (a Natural dye expert who has long worked with weavers across India). 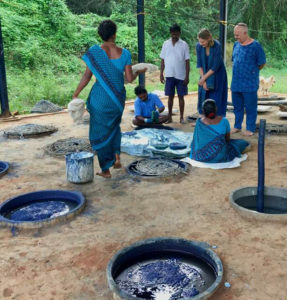 On this special anniversary of 25 years of existence, we were very happy to also celebrate that our new natural indigo fermentation dyeing facilities are functional. Funded by Levi Strauss & Co. this set up significantly increases our dyeing capacity as well as saves water due to its suitability to dyeing at fibre stage. 7 March 2018: The New Indian Express came to visit. We share an extract of the article they published, with the full article available here. Always something of interest for the natural indigo fan in articles on The Colours of Nature. 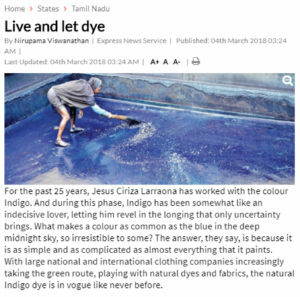 And we like their headline “Live and let dye”, which to us also means Live and let live, because that is what natural dyes do. Extract from article in The New Indian Express on March 4th 2018. “Natural Dyeing in Action” – Welcome to The Colours of Nature Open House. All are invited to come and see dyeing in action at our premises on Monday March 12th from 9am until 12.30 and from 3.30pm until 5pm. Meet at the gates at 9am or at 3.30pm. Jesus will take you through the production and show you the new installation coming up – we are increasing our natural indigo fibre dye capacity supported by Levi Strauss & Co. and 62 pots of 1000 litre capacity have found a home behind the current dye set up. The tour will end at the Showroom where you can also look at the available products. Remember, we don’t only dye in indigo blue – different shades – but also manage the entire palette using plants like marigold, rubia cordifolia, and more. The Colours of Nature is one of few truly natural dye units in the world – savour the opportunity!